I think the thing photographers obsess most about is camera gear– what camera is best, what lens is sharpest and what accessories do they have to have to take great pictures. But, while your camera and lenses are vitally important to making your art, getting away from your computer and getting out and about taking pictures- whatever gear you've got- is more important. In other words, just do it. I got serious about taking pictures as a high schooler in the early 1980's. And to be honest, one of my favorite pictures of that time in my life was a sunset taken from a moving boat with a small, compact 35mm pocket film camera (the Olympus XA2) on Kodachrome 64 film. It's not a technically superior picture, but it evokes lots of good memories for me of a special time in my life, and that makes it a very successful picture. Wouldn't it have been great to have used my medium format, 51-megapixel digital camera instead? Sure, but it didn't exist back then and I still got a picture that I love. The lesson of this story? Use what you've got and don't let the lack of superior gear stop you from making photographic masterpieces. Having said all that, we all aspire to use the best possible camera gear, and as our experience grows, we yearn to make better pictures on better cameras with better lenses. I don't buy new gear very often, so my equipment has been bought piecemeal, over a long period of time. Some of the lenses I bring on every trip were bought as long ago as 1991. Below, I'll list what equipment I'm using for landscape photography now. This isn't to inspire you to rush out and duplicate my list, but just to show you what I'm currently using and what sort of extra items I use to make the images I do. I've also included links to the items on Amazon so you can read more about them and see what the current prices are. Camera- Pentax 645Z medium format digital camera. I also use Canon cameras in my day to day photography when I'm not traveling. If I could, I'd bring my Canon 1DX Mark 2, but to save weight, I only bring the Pentax to Acadia with me when I'm flying in. Don't forget extra batteries- I have two for my camera. One lasts me almost a full day of shooting and I'll always charge both overnight. If you're using a mirrorless camera, they can drain a battery very quickly. Consider buying several (they tend to be cheaper than SLR batteries so you can afford to buy four or five). Lenses- wide angle zoom (28-45mm f/4.5), normal lens (75mm f/2.8), short telephoto macro lens (120mm f/4), telephoto (200mm f/4)- the last three lenses were bought over 25 years ago and can still be bought secondhand. Camera cards- I always use Sandisk Extreme cards and have never had an issue with any of them. I have a 64GB card and a 32GB card for my Pentax camera. Make sure you're choosing the correct card for your camera- SD, CompactFlash or CFast. Tripod- Manfrotto carbon fiber 190CXPRO3- a lightweight tripod perfect for carrying around on long walks, but sturdy enough to hold my heavy camera and lenses. 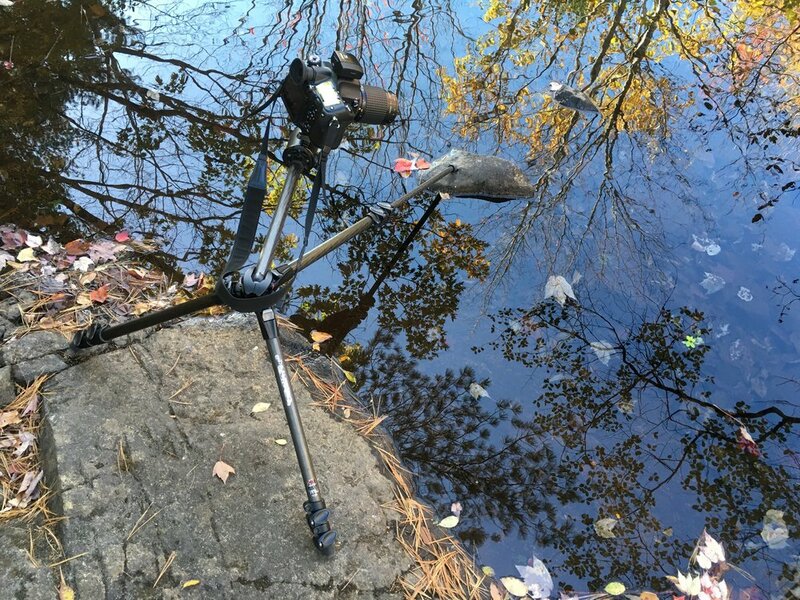 Carbon fiber tripods weigh less than traditional steel tripods but are still very strong. Choose a tripod with legs that extend outward as well as just up and down. Mine has a center post that extends outward too, allowing me to place the camera out beyond the legs and position it in hard to reach places, like out over this small stream at Duck Brook. Tripod head- Arca Swiss Z1 Monoball- this versatile tripod head is built like a tank and can hold my heavy camera at any angle without slipping- up to 132lbs! It's much easier to use than a conventional three handle pan/ tilt head. It's expensive but it should be the last tripod head you'll ever buy. Filters- I use the Lee Filter system. I'll list the individual filters I use, but you need the starter kit first to be able to use their filters, then you'll need adapter rings to be able to use the filters on all of your lenses. My lenses have filter threads of 82mm, 77mm, and 67mm, so I need adaptor rings for all of them. The Lee Filter holder (left) and various sizes of adapter rings I use. Polarizing Filter- Most photographers only think of polarizers are being useful for deepening blue skies, but they're also really useful for eliminating reflections on water– and also wet leaves, helping to saturate the colors. My most used polarizer is the 82mm slim-line version, which fits best on my wide angle lens and avoids vignetting that sometimes happens when you put a filter on a very wide lens. There are several good filter manufacturers, but B+W in Germany makes some of the most optically sharp filters. Always buy high quality filters; there's no point putting good money into quality lenses if you'll put cheap filters on them that degrade your images. Graduated neutral density filters- a must have for landscape photography. I use both the .6 (2-stop) and .9 (three stop) Lee filters with a hard edge. Using a graduated neutral density filter while shooting a sunset from Cadillac Mountain. The top half is darker than the bottom, to bring down the brightness of the sky closer to the brightness of the ground. The cord resting on top of the lens is an intervalometer to shoot time lapses. Neutral Density filters- I like slowing down my exposures dramatically, sometimes going as long as five or six minutes, but to do this, I need to use a very dark neutral density filter to lengthen the exposure time. I use the 10-stop Big Stopper filter by Lee. I use it sparingly but it opens up a world of very cool images! I also use Lee neutral density filters like the .9 (3-stop) and .6 (2-stop) filters. Filter bag- I used to have filters sliding around loose in my bag until a couple years ago. Now I use a LowePro filter pouch that holds all my filters in one handy bag. Two-directional bubble level mounted in the flash hot shoe of my Canon 5D Mark 2. Bubble level- my current camera has a built-in electronic bubble level, but before I bought it, I always used a handy little bubble level that fits onto the hotshot of your camera. It's really useful when you're taking pictures with a distinct horizon line, like sunrise over the ocean. As good as I think I am at eyeballing whether my camera is level, I often find it's off just a little when I get back home and look at it on the computer. Camera bag- I've been using a Tamrac camera backpack since 1994- the Summit 777 which isn't made anymore. The Anvil 23 is a similar model. There are plenty of other good bags out there. Don't get anything too big– remember you don't want to be weighed down out on the trail. Personally, I don't need to carry around a laptop in my camera bag- it stays in my hotel room at all times, but most camera bags these days have enough space to carry one with you in the field.